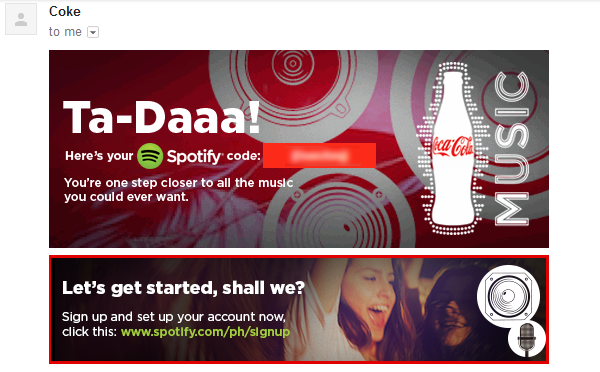 Music streaming site Spotify is available in the Philippines at last, thanks to a tie-up with the global brand Coca-Cola. The launch was announced through Coca-Cola’s official Facebook and Twitter accounts yesterday. This move is one move towards fighting the problem of piracy in the country. It’s the perfect tie-up for Coca-Cola because much of their advertising and marketing campaigns are rooted in music. 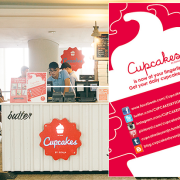 It’s also a brilliant example of branding and online marketing for both brands. Let’s have a look. Coca-Cola has also used this opportunity to gather new leads. The sign-up process for Spotify in the Philippines isn’t as simple as visiting their site, creating an account, and downloading the software. You’ll need to send Coca-Cola an email, and they will send you a code and sign-up instructions you will use to create an account. 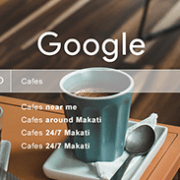 You’ll be taken to the signup page for users in the Philippines. Note that the signup page says it’s a preview. This means you can expect the service to be available to everyone later. As with other users of Spotify, two options are available for new Filipino users: you can choose the free plan, which lets you stream music for an unlimited period, but with ads; and the subscription plan, which lets you stream without ads and download music offline legally for PhP129.00 a month. Spotify is currently available as a desktop app for PH users during this exclusive preview period, but they will make the app available for other platforms and devices soon. The partnership between Spotify and Coca-Cola is a smart move for both brands. Spotify will be able to use Coca-Cola’s global reach and tap into their large market. In turn, Coca-Cola has a new platform where they can advertise and increase their brand presence. 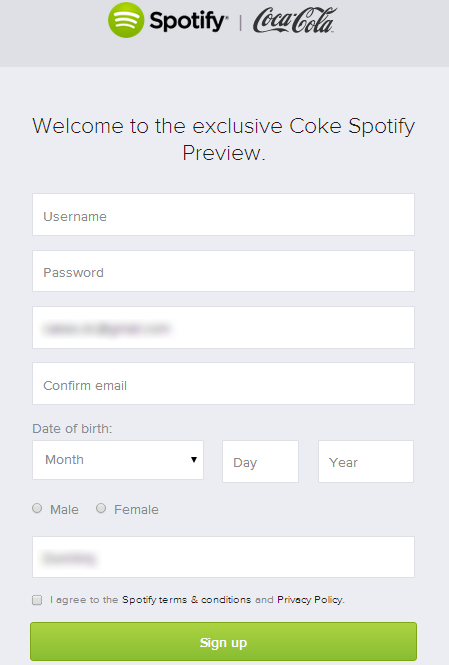 Notice how Coca-Cola’s logo is in every page of the Spotify signup process. 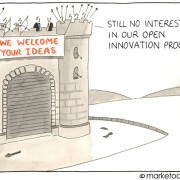 They have deeply integrated their brand into the process, as described in the previous section. 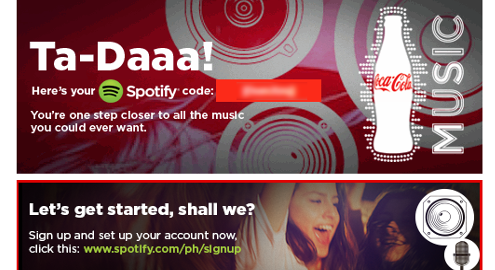 On the other hand, Spotify is benefitting from the fact that Coca-Cola is promoting their brand heavily in social media now, lending the power of their endorsers (one of those mentioned on Facebook was local actor Enchong Dee) to attract more users to sign up for the exclusive preview. Collaborating with providers related to the way you present your brand in general (in this case, Coca-Cola and music) is a good way of creating mutually beneficial relationships. 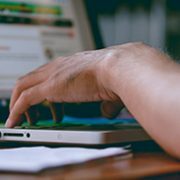 Explore which providers will be willing to enter into a cross-deal with your business for promotion. Brand presence is everything. You need to maintain branding across all properties, and sustain the look, feel and message you want to communicate to your target audience no matter what you are promoting. 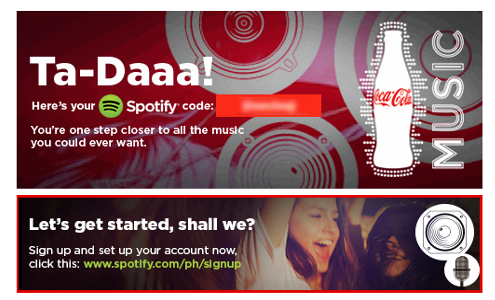 Coca-Cola has succeeded in doing this throughout their promotional materials for Spotify, and vice-versa. Use every opportunity you have to gain new leads from an online promotional tie-up you may have. Coca-Cola does this brilliantly by getting new email leads out of the signup process. Use all the online resources you have at your disposal while waiting for the other marketing efforts. 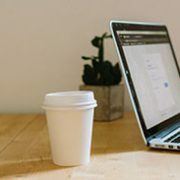 In this case, email and social media play important roles in acquiring leads and sign-ups, while the simple sign-up form makes it easy to gain more users. 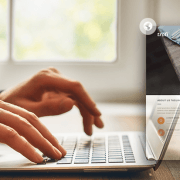 Talk to us today – we’d be happy to help you carefully plan an effective online marketing strategy that highlights your brand.